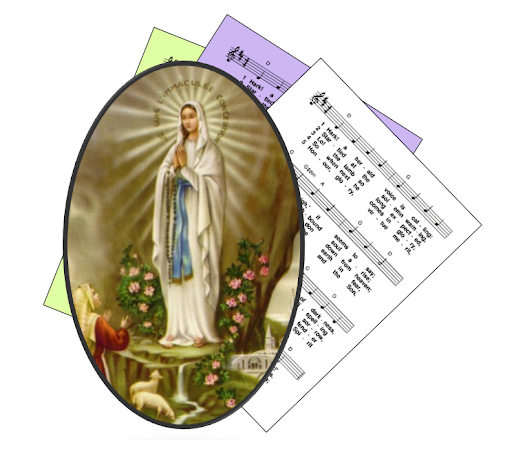 A selection of free-to-use (ie public domain or copyright-free) hymns and song suggestions for World Day of the Sick and the feast of Our Lady of Lourdes. At Lourdes in France, Mary appeared to a young girl in 1858, under the title "the Immaculate Conception.". Today, Lourdes has become a place of pilgrimage, faith and healing, and 11 February is an "optional memorial" feast day for Our Lady of Lourdes. World Day for the Sick was instituted , sharing the same date, in 1992, as a day for remembering the sick and those who care for them. Because it is a fixed date (11 Feb), the readings for the day vary. Therefore the hymn suggestions below are based on the general themes of Lourdes and caring for the sick, rather than any particular lectionary readings. This can be quite a challenging theme, because of the very wide range of situations that sick people and their caregivers may be in (terminal illness, chronic illness, short-term situations). Making communities and civil society more sensitive to people who are sick.